It is an all-too-common lament of busy genealogists — that we have too many ancestors, and too little time. And it’s time that’s needed, not just to properly document the members of our families — to identify them accurately and attach them to the family tree in the right place — but to tell their stories. Who were they? How did they live? What were their lives like? That part of what we do as genealogists is every bit as important as the names and dates and places. Yet sometimes… sometimes we realize we are falling short. Case in point: my grandfather’s cousin, Ludy Katherine (Green) Aycock. 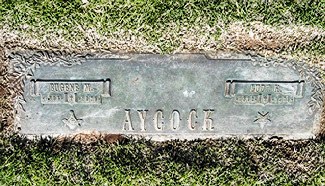 We know that Ludy was a school teacher before her marriage to Eugene M. Aycock. 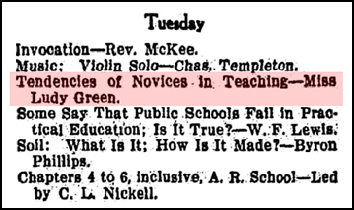 She’s shown as a teacher on that 1910 census, and her name appears twice in the news pages of the Wichita Daily Times, a newspaper published in Wichita County, Texas: once, on Friday, 20 December 1912, in a list of those in attendance at the Wichita County Teachers Institute;7 and the next year, on Friday, 21 November 1913, as a speaker at that year’s upcoming Institute.8 Her topic was to be “Tendencies of Novices in Teaching.” At the ripe old age of 21, she couldn’t have been far from a novice herself. Exactly when Ludy married Eugene isn’t known yet. Her obituary places the day as May 27 and the place as Aspermont, the county seat of Stonewall County, Texas.9 But here’s where our efforts fall short on the names-dates-places side. We haven’t looked at the Stonewall County marriage records yet. Now after having read all of those facts, you may be sitting there thinking how much we know about Ludy Katherine (Green) Aycock. And I’m sitting here thinking how little we know. You see, Ludy and Eugene didn’t have any children. So the stories of her life aren’t being passed down. I don’t even have a picture of her. • What was she like? • Was her voice soft or loud? • Did she laugh a lot? • Was she a good teacher? • Did those in her Sunday School class look forward to seeing her every week? • Did the customers at the Coffee Shop joke with her? Did they miss her when she retired? • Who remembered her on her passing — was her funeral well attended? • Who remembers her today? I know how Ludy fits into my family tree. What I don’t know is who she was. My job as a genealogist is far from done. Marker image: Paula Williams, 2004. Unfortunately, he has no other photos, and never really knew Gene and Ludy, so that’s about all we get, but that’s something, anyway. This is a good reminder for me to try him again to see if maybe ANY of his relatives would have any stories or anything else. Mmmph. I may have had that, but I didn’t have Wichita Falls articles! Besides, this post reminds me of how many balls I’ve dropped on The Ludy Quest – she was quite an obsession of mine before, during, and after my trip to Levelland, and I even came up with several ideas, but only pursued one or two of them. I’m very glad you wrote about her today. Hopefully it’ll inspire me to pick up a couple of those dropped leads. My bad entirely – I think sharing the source of my finds got lost in the excitement of the other finds I made that day (the discovery of the Johnson-Fore connection, for example). It was actually from page A-13 of the Monday, September 1, 1975 issue of the Lubbock Avalanche-Journal, obtained from microfilm at the City of Lubbock Public Library. Gene’s was published on page A-13 (yes, same page number) of the Saturday, September 13 edition of the same paper. Wonderful story and I think we all have these ancestors of which we know so little. Even though 1975 was a long time ago (gosh, I was still in college), I wonder if there are any residents in town that remember her as their Sunday School teacher? Plus through the other organizations of which she was a member? I was seriously thinking today, Lisa, that I need to go to Levelland and find everybody old enough to have known her.